Heart of the Home: Happy Valentine’s Day! So … dreary January is giving way to an avalanche of red and pink-themed gifts and ideas for Valentine’s Day – even if you’re not that keen on those shades, it’s difficult to avoid them! So here at Anwyl we’ve decided to embrace the concept and make some décor suggestions for your new home, but with a teeny little bit of a romantic angle! The idea of introducing a fabulous, vivid and bright accent colour into your new home décor might be a little bit startling, but as our ideas show, adding a deep red to a neutral room is a very good idea – in a smaller room the result could be enclosed and jewel-like, in spacious and bright rooms like these shown above, the look is exciting and glamorous. Shade shown here in both pics is Caliente AF-290 by Benjamin Moore Paint, and it comes in various finishes, from Flat to Matte, Eggshell and Satin/Pearl, so there’s a finish for all eventualities. 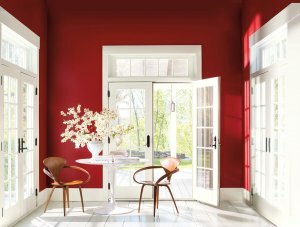 We’re rather keen on the idea of painting woodwork and skirtings in vivid shades as well (although not perhaps in this particular red!). If a red scheme is going one step too far, consider softer shades of pink and coral instead, which can still add a warm glow to a room, but without ‘shouting’ so much! Which is one reason why one of our favourite colour inspirations of the last couple of years is Heart Wood from Dulux; it was their Colour of the Year for 2018, and is becoming a firm favourite. 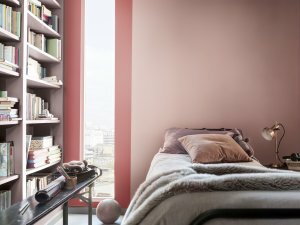 There are similar deep, dirty pinks in other paint collections too, namely Musk Pink by Zoffany from Style Library (the emulsion has a superb matt finish) and Sulking Room Pink by Farrow & Ball – which was one of the wonderful new colours added to their range last year. 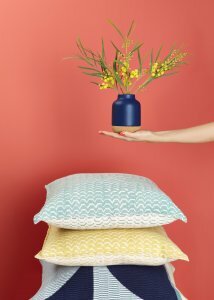 So, as red and pink shades seem to be the order of the day, we also have to include an inspirational idea from Debenhams, which is a great example of a shade such as Living Coral can mix up perfectly with yellow, aqua and blues – so these warm shades that we’re so enthusiastic about can be balanced by cooler shades of blue and white. 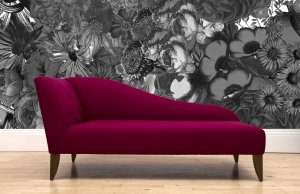 We just had to include a romantically red chaise longue in our February story … this is the amazing Romulus daybed or chaise longue, from Rume. All upholstery items are made to order and come in a vast array of fabrics, patterns and colours. We’re imagining this crimson version positioned in a beautiful bay window, or at the end of a luxurious bed, strewn with fabulous cushions! 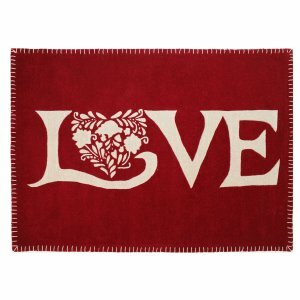 A little splurge on accessories is perhaps a bit more realistic than new paint schemes and furniture in honour of Valentine’s Day, so here are some lovely suggestions: From left; the Love rug by Jan Constantine for Dunelm could be a great gift idea for a loved one (and it’s practical too! 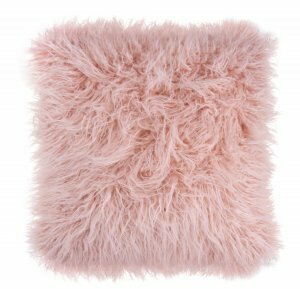 ); you can’t go wrong with a fluffy or furry cushion – this pale pink faux fur one is from Debenhams, but beware, it’s likely you’ll want to buy more than one! 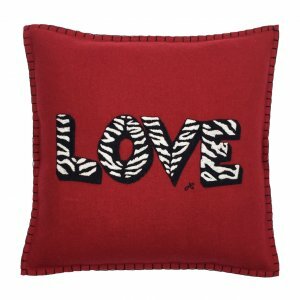 And we also love the LOVE Zebra cushion, also by Jan Constantine for Dunelm, as before. It had to be done – who could resist a love seat for Valentine’s Day! These large, squishy, beautifully proportioned chairs are becoming very popular, and are a good idea for small and large rooms alike. A love seat is usually big enough for two to cuddle up together, or for one person to sprawl comfortably with hot water bottle, blanket and cuppa. A love seat, or large armchair, or 1.5 seater can be the perfect addition to a large three-seater sofa or an L-Shaped sofa to give a little more flexibility to seating and TV-watching moments! 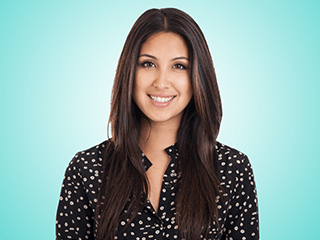 Don’t forget, when you’re planning furniture purchases for your new Anwyl home, take a tape measure with you and make templates of large items so you can see how they will fit into your new rooms. This is the Dixie love seat from Loaf, available in an array of fabrics, of course. 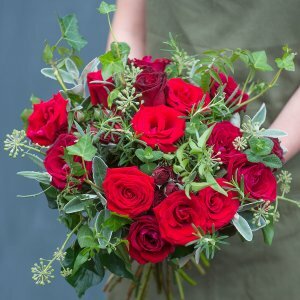 If furniture is off-menu for Valentine’s Day, remember that you can’t really go wrong with flowers, and some of our favourite bouquets are from The Real Flower Company. Order in plenty of time, don’t end up rushing into a late-night store for a bunch of sad-looking carnations!